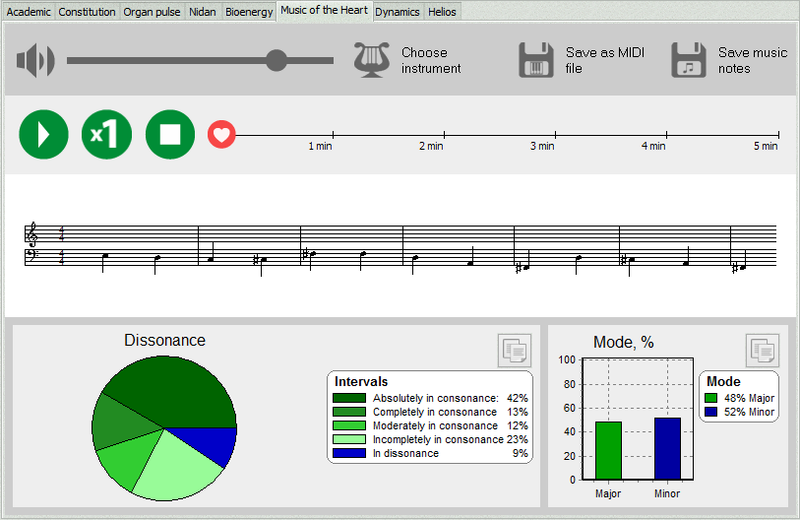 Music of the Heart is a software extension for VedaPulse program. It transforms recording of the heart rhythm into music, which can be listened, saved as audio file or in the form of a music text. Extension also conducts a musical analysis: defines a share of consonant and dissonant chords as well as ratio of major and minor tonalities in the melody of the heart. Music of the Heart offers a completely innovative approach to the perception of the heart rhythm and to its analysis. We will not even try to limit the number of experts who could benefit from it. The fact that the laws of musical harmony and human health are universal has been known since ancient times. This is evidenced by such sources as the Gandharva Vidya in Ayurveda and the Pythagoras’ and Aristotle's doctrine of spheres harmony in antiquity. This idea goes back to the global philosophical principle, namely, the idea of unity of universe laws. In this regard, the use of mathematical laws of musical harmony, applied to assessment of the heart rhythm, is quite natural. Music of the Heart opens up a whole new chapter in the analysis of heart rate variability. The roots are not forgotten: it is suggested to use the musical experience gained over the centuries for the analysis of the heart rate. ​What Melody Is Your Heart Playing? Healthy body and properly working heart is the dream of many people. Music of the Heart can help determine how comfortable this organ feels, how harmoniously it functions. With the help of this application heart rate rhythm is "divided into music elements", i.e. transformed into a piece of music. Analysis by means of the Music of the Heart is based on the long-known laws of musical harmony, which have physical and mathematical basis. Many tractates of the ancient scholars refer to the unity of the musical harmony and fundamental principles of human health. The use of such knowledge in a modern life to determining health level is quite essential. Data, obtained from this extension, is mainly used for the analysis of a heart condition, determining minor or major tones. When the main problems in the heart are found, it is be much easier to correct the treatment scheme, for example by naturopathic methods that will optimize the cardiac state and overall condition. The extension allows transforming real "heart music" into a melody or music text. These features are designed to analyze the heart rhythm, its key and overall harmony of sound in the most convenient form for experts. This extension is very likely to be the most versatile since it can be used by both specialists in alternative medicine and experts, who treat patients with methods, which are less known. It is also possible to use the musical melody for self-analysis.